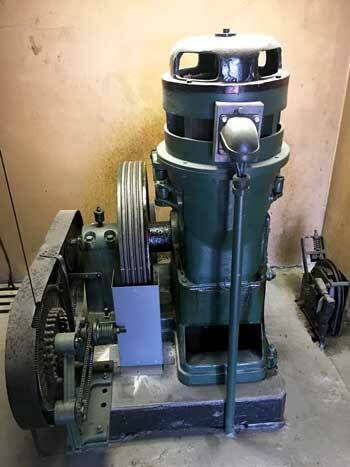 Building owners and managers whose properties continue to operate Single Speed AC traction elevators should seriously consider upgrading their equipment to modern standards, and there are many good reasons why. Continued operation of this outdated technology presents many problems: code compliance issues, ongoing repair costs, insurance costs, risk of downtime, but, above all – because of their inherent leveling issues – discomfort and risks to passengers and exposure to consequent trip-and-fall litigation. Single-speed AC (SSAC) electric traction elevators are slow speed, low-capacity passenger units that may cause the elevator not to stop within level. They first appeared during the post-World War II period, often installed as upgrades to earlier, prevalent DC systems as the municipal trolley grids that powered them became extinct, with installation continuing into the 1970s. Popular because they were attractively priced, they typically appeared in low- to mid-rise residential buildings, including condo conversions and rental apartments. 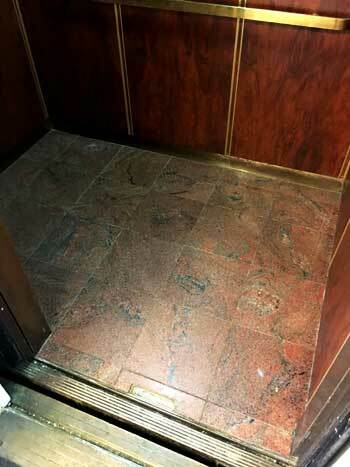 These elevators travel at one speed, which makes them prone to intermittent leveling fluctuations and trip-and-fall trip hazards, particularly to elderly passengers and those with mobility disabilities who may find it extremely difficult to negotiate level differences. These elevators are now obsolete and no longer made or installed. Current New York State code requires that elevators, when arriving at a floor, stop accurately and consistently within a finite limit of ½-inch above or below floor level. This is reflected in the current edition of The American Harmonized Elevator code (CSA B44/ASME A17.1). The Technical Standards & Safety Authority (TSSA) has also written on the matter, that these elevators, because of their poor leveling ability, should be upgraded. 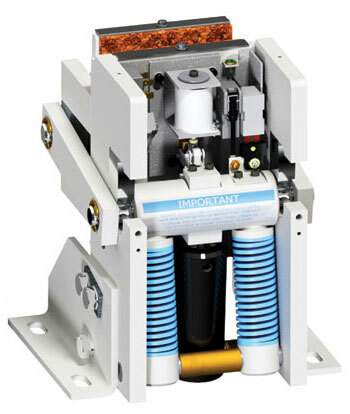 SSAC elevators relied on brakes to stop the car in properly level position, which often proved imprecise and inaccurate. Conversely, today’s elevators have abandoned the use of brakes to stop the car, instead employing variable voltage-variable frequency control systems that consistently stop the elevator at floor level within tolerances of ¼-inch. As their name implies, these adjust both the voltage and frequency of the power applied to the hoist motor, thereby varying the speed at which the motor operates. With this technology, the hoist motor can be brought to a so-called “electrical stop” – with the hoist motor energized but not turning. This allows floor stops to be accurately specified, without regard to the load in the car. The experts at D&D Elevator stand ready to help you evaluate your particular needs, to cost-efficiently achieve code-compliance, safety – and peace-of-mind! Significant Code Changes that will SOON Affect Your Elevators! ACTION REQUIRED! REMINDER: For reasons of safety and code compliance, property owners and managers need to be aware that there are requirements that must be adhered to, and that the deadline is rapidly approaching! First up is regarding Elevator Door Lock Monitoring. The New York City Department of Buildings has announced that – by January 1, 2020 – all "automatic passenger and freight elevators must provide a system to monitor and prevent automatic operation with faulty door contact circuits." Elevators installed or modernized prior to July 1, 2009 will require a software and possibly a hardware update. 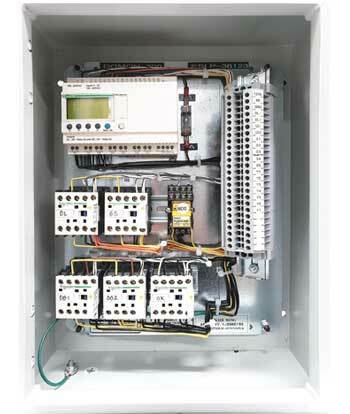 Controllers installed or modernized after July 1, 2009 may already be partially compliant and may require installation of additional hardware or software – this will need to be confirmed by the elevator contractor. Elevators installed or modernized after January 2, 2015 may be equipped to be made fully compliant but, may need hardware or software installed. This also should be confirmed by the elevator contractor. If the controller cannot be adapted with the hardware or software upgrades, a modernization may be required. All modifications and/or software changes to the controller will require filing with the New York City Department of Buildings, and inspection and testing upon completion. Further ahead, by 2027, Rope Grippers will be required by the NYC Building Code 2.19.2 and 2.8.4.1 Appendix K. Elevators without them will be considered non-compliant. Such devices – developed to safeguard passengers by stopping an elevator in case of a mechanical and/or electrical failure. Rope Grippers will be required by the NYC Building Code 2.19.2 and 2.8.4.1 Appendix K. Elevators without them will be considered non-compliant. Such a device – developed to safeguard passengers by stopping an elevator in case of a mechanical and/or electrical failure – must be installed on all elevators by 2027. Rope grippers detect emergency situations, including if a car leaves a floor with the door open. They provide over-speed detection and unintended car movement with the door open when caused by brake, control or drive failure. The experts at D&D Elevator stand ready to help you evaluate your particular needs – to cost-efficiently achieve code-compliance and safety – and boost your peace-of-mind! For your convenience and future reference, we have created a 2-page fact sheet that you can print as a PDF and retain. Bob Schaeffer demonstrating distance learning at the Elevator Learning Center, advanced communications technology that allows students anywhere to visually interact online with instructors, using high-definition video streamed with high-fidelity audio. 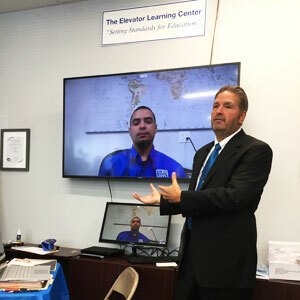 “The reality is that college isn’t for everyone,” said Yonkers Mayor Mike Spano at an October 17th media conference as he welcomed the Elevator Learning Center to the city. 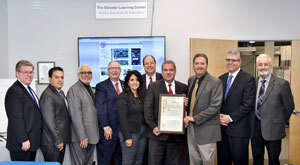 “It is so exciting that D&D is enabling a solid middle-class living for kids and young people who would prefer working at a trade to an academic pursuit.” The Elevator Learning Center is in talks with the Yonkers school system about creating programming for its Trades and Technical High School, to create a feeder program for later entry into an apprenticeship program at the Center. Left to right: Kevin Cacace (President of the Yonkers Chamber of Commerce and Yonkers School Board trustee), Dr. Edwin Quezada (Superintendent of Yonkers Schools), Reverend Steve Lopez (President of the Yonkers School Board), Mike Breen (Yonkers City Council - District 5), Susan S. Naber (Principal, Vive/Yonkers Pathway To Success School), Chuck Lesnick (representing the N.Y. State Governor's office), Yonkers Mayor Mike Spano (with Proclamation), Bob Schaeffer, Michael Bonardi and Nunzio Meccariello of D&D. At the media conference, Mayor Spano, accompanied by numerous Yonkers community leaders, presented D&D with a proclamation for its contribution to the Yonkers community. Schaeffer, alongside D&D partners Michael Bonardi and Nunzio Meccariello, stated that for him the formal opening of the Center was bringing great personal satisfaction. “For me it’s very exciting. I was involved early on in the actual process to create the Certified Elevator Technician (CET) program and the accreditation process. We have an accreditation from ISO (International Organization for Standardization) and ANSI (American National Standards Institute),” he said. Schaeffer noted that since its founding in 1981, safety has been D&D’s number one concern, not only for the public that rides the elevators serviced by the company, but equally for the technicians who install them and keep them maintained.